Here are the latest offers from SMCS! Why pay upfront for service and repair bills? PAY OVER MONTHLY INSTALMENTS - INTEREST FREE!! 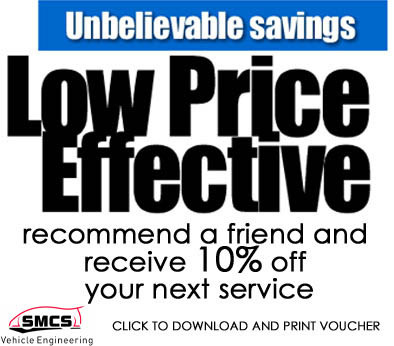 Recommend a friend to SMCS and receive 10% off your next service at SMCS (presented by the friend at time of booking). Just click on voucher, download, print and complete form. Terms and Conditions: Please note this discount code is at the discretion of SMCS. The code must be quoted during the booking process and unfortunately cannot be added after this time.